Russia, the biggest market in the world for exports of Australian kangaroo meat, has thrown the trade into confusion by announcing that authorization for the exporter, Macro Meats of South Australia, has been suspended. According to a July 25 notice from Rosselkhoznadzor (RSN), the government’s veterinary and phytosanitary inspectorate, a container load of kangaroo meat was stopped when inspection found that it originated from a source other than the one licensed for import by RSN. Although RSN isn’t specific, the port is believed to have been Vladivostok, and the seizure about three weeks ago. 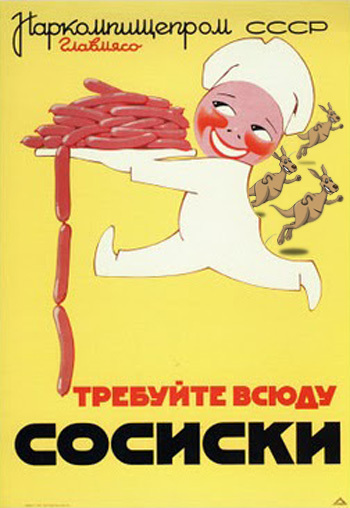 Most of the kangaroo meat landing in Russia goes into sausages fabricated and consumed in the Russian fareast. This has been because domestic beef and pork production in the region has been too small to fill the sausage skins, and kangaroo can be landed from Australia more cheaply than imported American, European or Chinese pork. To the south, in China, Australian kangaroo traders claim that choice, higher-cost fillets of the kangaroo are potentially in high demand. But for the moment, the Russian action to seize and destroy a container load, and order the revocation of the export-import certificate of Macro Meats is a trade crisis. Macro Meats says that in a container load of 744 twenty-five-kilo cartons, 19 of the cartons (475 kgs) were found with labels indicating their destination in the European Union. They had been mistakenly included in the Russian delivery; it was the destination, not the origin of the shipment which was in error, according to the Australians. “This was the result of human error by a third party,” said Ray Borda, chief executive of Macro Meats. At peak in 2008, Australia exported more than 10,000 tonnes of kangaroo meat annually, worth about A$38 million. At the time, Russia took 70%, making Russian demand for kangaroo meat greater than the Australian consumption, most of which was in pet food. But RSN imposed an import ban in August 2009, claiming it had detected bacterial traces above standard. The export trade dwindled to a third of the peak level. In 2011 then Australian Prime Minister Julia Gillard publicly pushed for the lifting of the Russian ban. One reason was that the flooding of the northeastern state of Queensland in 2010 generated a regrowth of savannah grasses on which the kangaroos feed. This in turn triggered more than 50% growth in the numbers of red and grey kangaroos, and wallabies. They were eating their way across the cattle runs owned by farmers who were voting in increasing numbers against Gillard’s Australian Labor Party. It was not until last November that the ban was lifted after an RSN inspection in Australia. In the five months to May 31 of this year, according to Australian government figures, the export volume has been recovering, and half of the kangaroo cargoes were going to the Russian fareast. “We are very hopeful that this mistake can be resolved quickly,” Borda said.